Our closest metro stop will be the famous Abbesses, it is only 1/10 of a mile from our apartment and it is famous for being the deepest metro in Paris. Montmartre in French means hill or butte, and at 130 meters elevation (429 feet) and Paris central about 30 meters elevation (100 feet above sea level) the Abbesses Metro is the deepest at 36 meters (118 feet) or 140 stairs. It has an elevator, that most of the time is out of order, so the stairs it is! 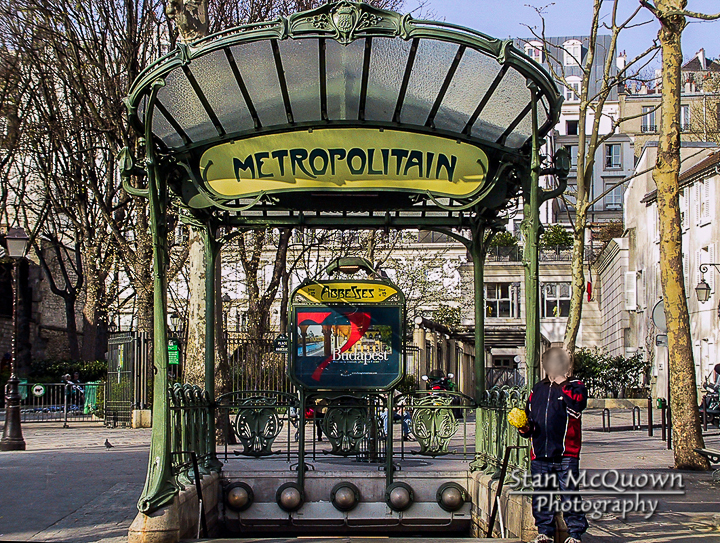 This picture was take in 2003 and the signature style glass cover was designed by Hector Guimard and is only one of two Metros left in Paris with the full glass cover, called édicules.